Mendel Rosenbusch lives in a small house behind the synagogue in a rural village. All the children love Mendel – he always has a bowl of delicious baked goods when they visit him on the Sabbath. Decent, friendly people love Mendel without knowing what makes him so likeable; while stingy, unfriendly people frown at him without knowing why. Mendel Rosenbusch seems to know everything, and he has a wonderful gift for reading in people’s eyes their most secret thoughts. You see, Mendel has a secret. One night an angel appeared and gave him ma magic coin. When Mendel puts it in his pocket, he becomes invisible. That was the wonderful gift God gave him for being so kind-hearted. Do you wonder what Mendel Rosenbusch does with his magic invisibility? First published in Czechoslovakia in 1929, these tales would have been forgotten had not an elderly New Jersey couple not come across a crumbling copy in a library in Santiago, Chile. Dr. Hans Fisher, a professor of biochemistry at Rutgers University, and his wife, Ruth, were in Santiago following the death of Ruth’s mother. As Dr. Fisher recalls, "The book was slim and gray, and, judging by its condition, I had gotten to it just in time. 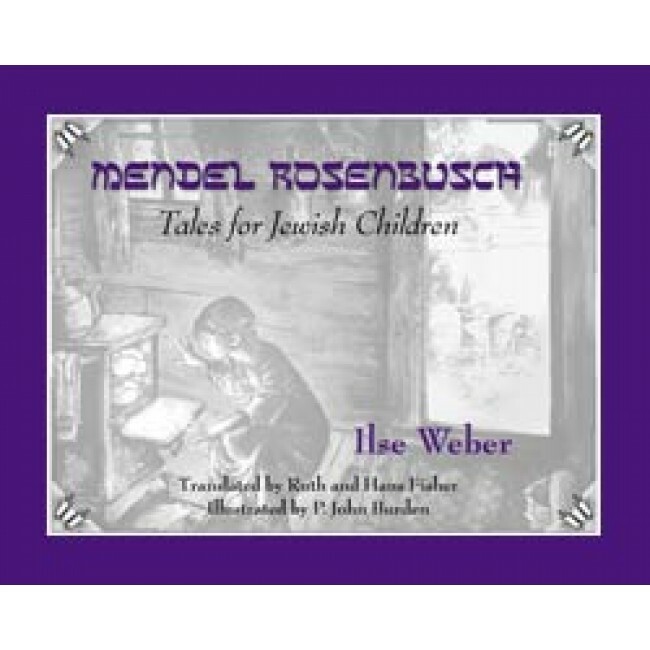 Portions of the cover, pages, and binding had been devoured by mice, insects, or both, but the title could still be read: Mendel Rosenbusch: Geschichten für Jüdische Kinder, or, in English, Mendel Rosenbusch: Tales for Jewish Children. Opening the cover, seeing again the stories flowing across the pages, transported me to my own boyhood in Breslau and the memories that could not have been contained in the book: Adolf Hitler passing below our family’s apartment in a motorcade; my friends and I suffering beatings from Nazi youth; my family fleeing the approaching Holocaust aboard the ill-fated St. Louis; the months in a French camp for refugee children. It seemed like a small miracle that I had found this particular book, and, over the next few hours, I devoured its contents as if in a trance. The charm, insight, and moral grounding that had made it one of my favorites more than a half-century earlier were just as I remembered. Within days, I was retelling such tales as ‘Uri, the Rascal,’ ‘Baruch, the Benefactor’ and ‘Simche, the Liar’ to my visiting grandchildren." A long search for the author, Ilse Herlinger, revealed that she had become Ilse Weber upon marriage in 1930, and that after two years in the Theresienstadt Concentration camp (1942-4), she and her younger son Thomas had been transported to Auschwitz, where they were murdered. In 1946, her husband Willy, who had survived Auschwitz, and their elder son Hanus, who had been sent to live with friends abroad, dug up at Theresienstadt the manuscripts of songs Ilse had written, where Willy had buried them. Ilse’s Theresen songs have been recorded by several artists, including Anne-Sophie von Otter and Bjent Kahane. Both Hans and Ruth Fisher and their families escaped from Nazi Germany. Hans was born in Breslau, Germany (now Wroclaw, Poland) on March 4, 1928. Trying to emigrate since 1937, Hans’ father, after incarceration in Buchenwald concentration camp, finally obtained a visa to Cuba. The rest of the family, Hans, his sister and mother, after crossing the Atlantic and being returned to Europe on the well-known ill-fated voyage of the St . Louis, eventually, joined Hans’ father in Havana, Cuba. From there, in early 1941, they all gained entry to the U.S., where the Baron Hirsch foundation settled them on a poultry farm in Vineland, NJ. Hans attended Rutgers University and the University of Illinois before returning to the Rutgers faculty where he had a distinguished career as professor of nutritional biochemistry. Ruth Hirshberg Fisher was also born in Breslau, the daughter and grand-daughter of judges. Because his brother had emigrated to Chile three years before, Ruth’s father was able to get visas for his family. In Santiago, Ruth studied violin and recorder.After marrying Hans and emigrating to the U.S. in 1950, Ruth qualified herself as an accomplished chamber-music performer at the University of Illinois Champaigne-Urbana. Her love of music has been transmitted to her three children and ten grand-children, who sing, and perform on violin, cello, and piano. Henry Dunsmore graduated in graphic and package design from Sheridan College in Oakville, Ontario. He worked with the Art Gallery of Ontario for 20 years in photography, graphic design, film and video production before moving to Prince Edward Island. "My only gripe with these folktales is the title. If they are just for Jewish children, that leaves out about 98 percent of children in the United States. And this collection of stories, originally published in Germany early in the twentieth century and translated into English, by Ruth Hirschberg Fisher and her husband, Dr. Hans Fisher, should be enjoyed by all. "These stories do more than that—they teach about Judaism and its traditions and remind us of our rich heritage and who we are. Whether we are baking “Shabbos Challah” or listening to the Megillah at Purim, we get a strong sense of unity knowing that we are not alone and that people all over the world bake “Shabbos Challah” and make noise when Haman’s name is mentioned. And as I said, these are not stories just for children but for all of us who want to know our pasts.